Somewhere towards the end of Stephanie Lake’s If Never Was Now I’m suddenly aware that I’m hearing a short section of music repeated from the first work in the double bill, Ross McCormack’s If Form Was Shifted. Apart from that moment of recognition detaching me ever so briefly from the action, it otherwise barely registers that the two choreographers are working from the same tight parameters set by Dancenorth’s Artistic Director Kyle Page. Very few ideas overlap in the works despite Page’s challenge to Lake and McCormack to each create a 30-minute work with the same five dancers, selecting sound from a one-hour score by composer Robin Fox, creating costumes from one pattern and limited materials with costume designer Andrew Treloar and utilising lighting from one grid designed by Bosco Shaw. Neither is there any sense that the choreographers have contrived to make the works different, they simply are. Page’s interest in how we construct self and meaning from the perspective of our unique experience is played out in this exercise, which is imbued with the mischievous rigour the Artistic Director brings to all of his creative explorations with the company. McCormack’s If Form Was Shifted is dark, twilit from a single point overhead and centred around a cluster of speakers where most of the dancers initially stand unmoving. Mason Kelly bucks and writhes on the floor like something not quite machine nor organism, but newly born and trying to map himself and his immediate territory. He gives off a palpable sense of oppression and anxiety, described in impossible angles. He makes it to a speaker, sits and drags his clothes half off to briefly reveal the lithe lines of his muscular back, momentarily elegant, transfigured. As rumbling industrial sound rises, the others place their hands on Kelly’s face, exploring and smothering. They stretch him out, each taking a hand or leg, the five forming symmetrical geometry for a few heartbeats. In a repeating gestural motif, they raise their hands to their temples, elbows out and then reach to touch the temples of the next dancer, again creating sudden shifts between awkwardness and coherence of form. Kelly and the expressive Ashley McLellan twitch and entwine, pushing their fingers into each other’s faces, babylike. The music, its beat grinding and vibrating, becomes almost unbearably loud. Jenni Large opens her mouth wide and slowly draws a resistant Harrison Hall’s open mouth to her own, and shares breath, while pulling a flailing, anonymous hand from below to her groin. The orgiastic scene continues as she stands on top of and walks over the group, until it collapses again and it’s hard to tell whose limbs are whose. The performers return to the orderly temple dance, connecting as if drawing on each others’ thoughts and energies and becoming a single organism or machine. 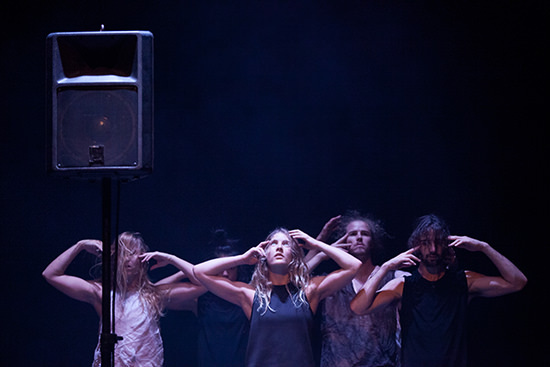 Georgia Rudd sees out the piece with a solo of emotional flux between ecstasy and bewilderment, while the others slowly return to being transfixed by the speakers. Rudd sits on a speaker and flicks the off switch. In contrast to McCormack’s chiascuro, simple set and understated, neutral costuming, Stephanie Lake’s If Never Was Now has the dancers in playful neon pink pants, carving out spaces through a mass of tiny foam balls which form an ever changing landscape as they move. The lighting is vari-coloured, directional and shifting, at times creating a second cast of enormous shadow dancers on the periphery. The action is bigger, with some precarious but controlled acrobatics, as the dancers lift, toss and manipulate. Jenni Large wallows in the foam, wild-eyed and exuding strength, flexibility and sensuality. She and Hall have a beautifully connected duo under blue light before fighting it out, lifting each other from the ground and literally butting heads. Hall is blown, rolled across the floor by the others fanning the foam, which forms a primal sea or shifting sands. Kelly and McLellan mirror shrugs, influence each other’s space without touching, breathe to their gestures before running, crashing, embracing, hitting and spinning off one another. All the dancers synchronise, an ensemble moving to a pounding beat and their own vocalisations, the squeak of the foam balls under pivoting feet adding more texture to the sound. The space grows darker and darker, the music softer and softer, four dancers retreating to the corners and using boards to fan the foam across the floor. It is so quiet now that you can hear the gentle shhhh of the waves of beads as McLellan is left in the centre where there is just a shaft of light and a trickle of ‘snow’ falling from above onto her head. Both choreographers’ intentions are realised in their creations: about If Never Was Now, Lake writes, “this work and the dancers… are continually transmuting and being affected by rapidly changing conditions,” while McCormack describes If Form Was Shifted as “[r]eflecting the body at odds with its purpose—a device grappling with its complexities and placement…somehow spectacular yet also pathetic.” Page’s parameters may have limited choice in certain physical aspects of the production, but his If _ Was _ premise opened up limitless possibilities. Read an interview with Dancenorth Artistic Director Kyle Page about the origins of If_Was_.